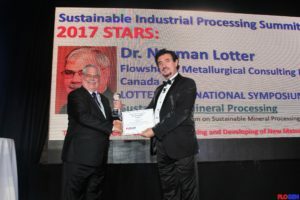 Fray award | Flowsheets Metallurgical Consulting Inc.
Norman and Heather attended the 2017 presentation of the Flogen Sustainable Industry Processing Summit (SIPS) in Cancun, Mexico, during the week of 22-26 October. The conference was attended by approximately 300 professionals representing science and engineering from many countries. In the above photo, the co-chairs and presenting authors of Norman’s mineral processing conference are shown. From left to right: Emile Scheepers (Vale), Dr. Andrew Menzies (U of Antofagasta), Prof. Kristian Waters (McGill U), John Starkey (Starkey and Associates), Shaun Graham ( Zeiss), Norman Lotter (Flowsheets Metallurgical Consulting Inc.), Chris Marion (McGill U), and Ravinder Multani (McGill U). The co-chairs are to be thanked for arranging a well-co-ordinated series of papers in a consistent theme. At the round table discussion, Norman led a theme of how we as practioners of modern Process Mineralogy could engage more of the mining and metallurgical industry in this practice. There was general consensus that a limiting factor was the degree of awareness of this technical discipline as a business opportunity. 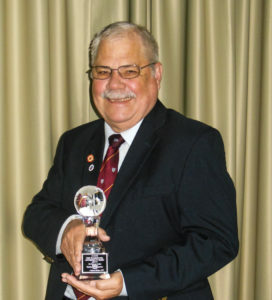 Norman was presented with the Fray International Award recognising his contributions to the mineral processing profession across his career. Norman is shown in the following photos with his award. 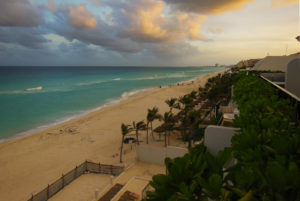 In our spare time, we enjoyed the Cancun weather. Here is a photo of the beach. Dr. Florian Kongoli and his Flogen organising committee are to the thanked for arranging an excellent conference. Click here to watch the interview with Florian. My wife and i felt really fulfilled Jordan could round up his web research because of the ideas he acquired in your web site. It is now and again perplexing just to continually be offering tricks which many people have been making money from. So we already know we have the blog owner to thank for that. Most of the explanations you’ve made, the easy web site navigation, the friendships you can help to promote – it’s many remarkable, and it’s assisting our son in addition to our family believe that that issue is fun, and that is extremely fundamental. Thank you for the whole lot!